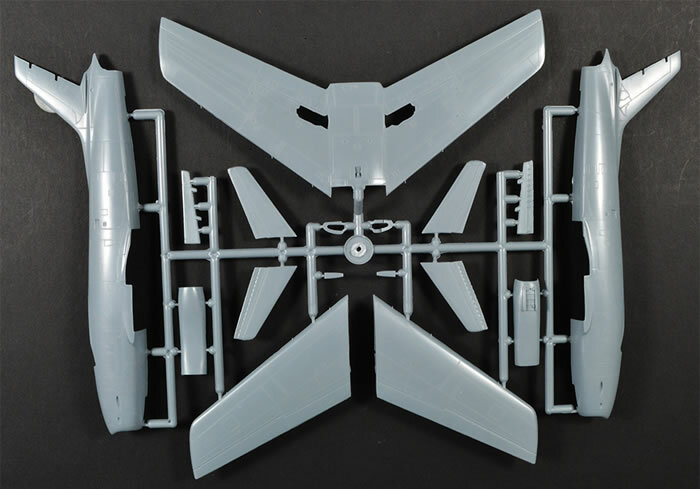 74 grey injected moulded parts on 2 sprues of, one clear sprue of 6 parts, a 2 part resin ejection seat, decals and instructions. 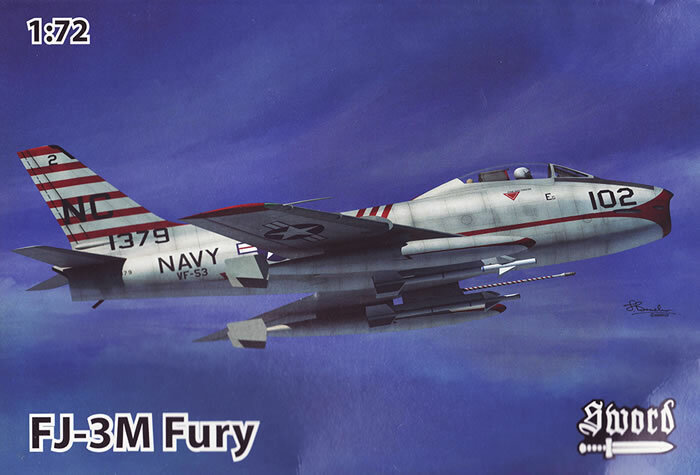 Advantages: This is the only FJ-3M Fury available in 1/72 scale. Accurate outline; crisp well detailed moulded plastic parts; nicely printed decal sheet with minimal carrier film and perfect register. Excellent resin seat. Missile armed. Optional canopy position.. Some minor flash around some parts. Limited release kit so will need some test fitting to ensure a good fit. Flimsy end opening box. 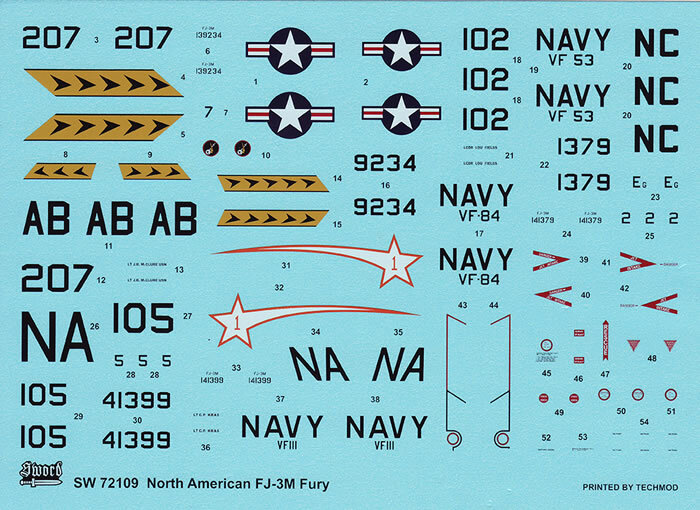 Sword Models have released the first FJ-3M Fury in the scale with 3 schemes. 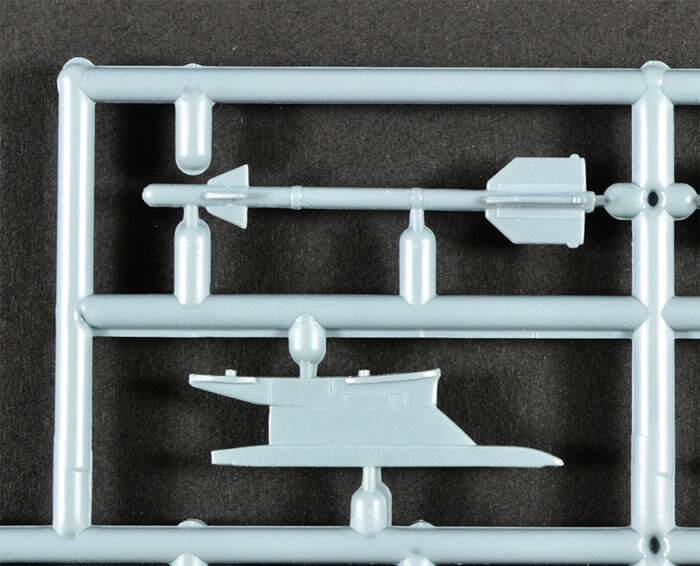 The model itself, is of a high quality and adds the option to your collection of the first missile carrying version. The North American FJ-2 and FJ-3 Fury were a series of swept-wing carrier-capable fighters for the United States Navy and Marine Corps. 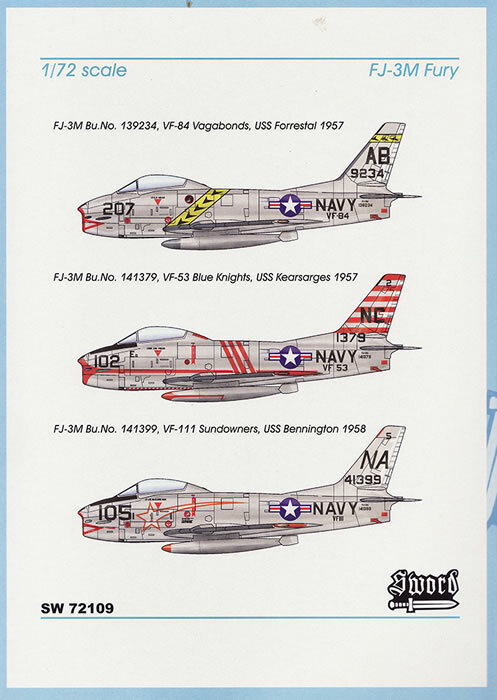 The FJ-2 resulted from an effort to navalize the United States Air Force's F-86 Sabre. These aircraft featured folding wings, and a longer nose landing strut designed to increase angle of attack upon launch and to accommodate a longer oleo to absorb the shock of hard landings on an aircraft carrier deck. Although sharing a U.S. Navy designation with its distant predecessor, the straight-winged North American FJ-1 Fury, the FJ-2/-3 were completely different aircraft. 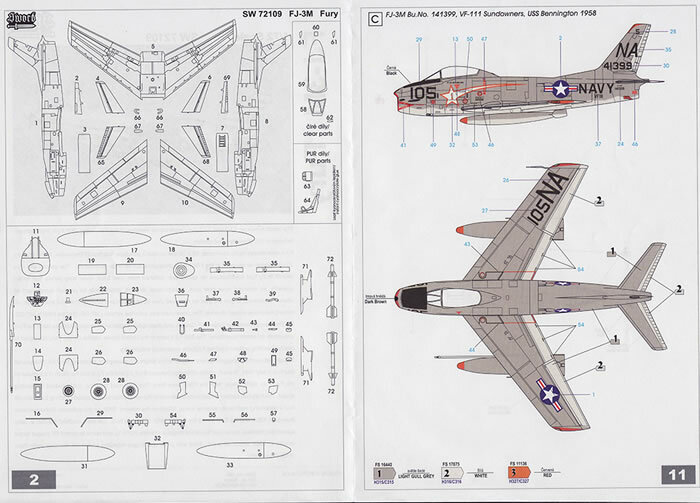 (The later FJ-4 Fury was, again, a complete structural redesign of the FJ-3). The FJ-2 was one of the aircraft used to evaluate the first steam catapult on a US Navy aircraft-carrier. Even while development of the FJ-2 was ongoing, the development was planned of a version powered by the Wright J65, a license-built version of the British Armstrong Siddeley Sapphire turbojet. The Sapphire promised to deliver 28% more thrust than the J47, for little gain in weight. The new version was designated FJ-3, and an order for 389 aircraft was placed in March 1952. To test the new engine a single FJ-2, BuNo 131931, was modified, but the first true production FJ-3 flew on 3 July 1953. The only externally visible change required by the new engine was a deeper intake to accommodate the larger mass flow. Early FJ-3s had the same wing as the FJ-2, but from 1955 onwards the FJ-3 was built with a so-called "6-3" wing, with a leading edge that was extended 6 inches at the root and 3 inches at the tip. 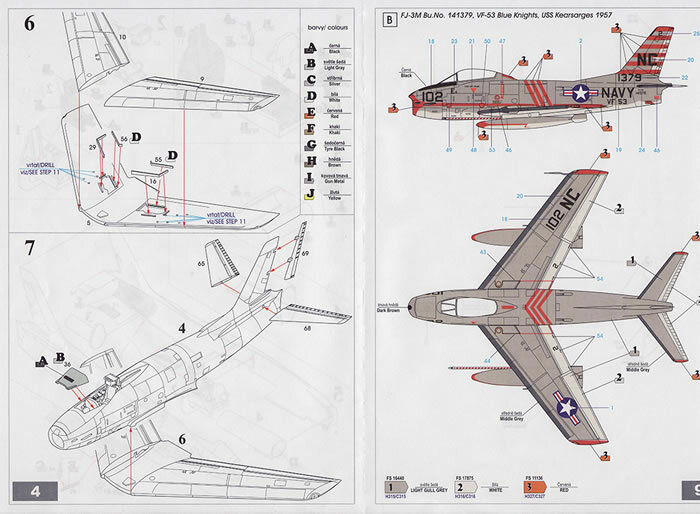 This modification, first introduced on the F-86F, enhanced maneuverability at the price of a small increase in landing speed because the leading edge slats were deleted. The version introduced on the FJ-3 was different from that fitted to the F-86F, as camber was applied to the underside of the leading edge to improve low-speed handling. On the FJ-3, the new wing leading edges also held extra fuel. From the 345th aircraft onwards, the wings were provided with four stations for external loads, up to 1000 lb on the inboard stations and 500 lb on the outboard stations. Deliveries began in September 1954, and the FJ-3 joined the fleet in May 1955. An FJ-3 was the first fighter to land aboard the new supercarrier USS Forrestal in 1956. Problems were encountered with the J65 engine, including failures of its lubrication system under the acceleration of launch or during manoeuvres, and failures of the turbine blades. Nevertheless, the Navy was more satisfied with the FJ-3 than it had been with the FJ-2, and in March 1954 it ordered an additional 149 aircraft. Because of its more powerful engine, the FJ-3 was superior to most models of the F-86, except the F-86H. A total of 538 FJ-3s were built. Of these 194 were modified to FJ-3Ms with the ability to carry AIM-9 Sidewinder air-to-air missiles. Some FJ-3s were later modified to control Regulus missiles (KDU-1), and F9F-6K Cougar target drones. In 1956 the Navy retro-fitted all its FJ-3s with probe-and-drogue air refueling equipment, a long probe being fitted under the left wing. 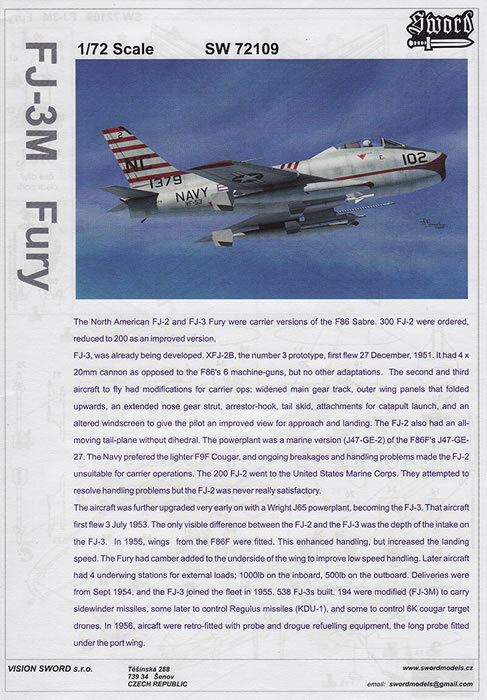 This is the 3rd of a series of Furies released by Sword and is the -3M version, the version to use Sidewinder missiles. 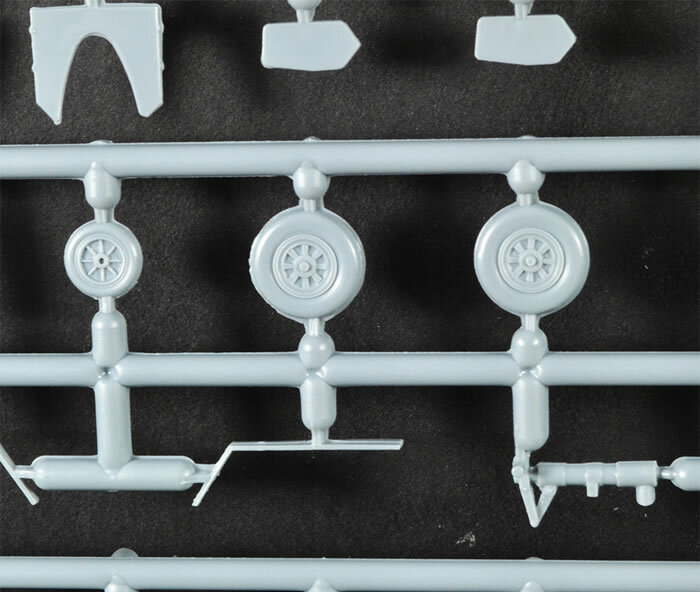 The kit has 2 grey sprues of injected parts which are clean with minimal flash and typical of Sword, have a shiny surface. The main parts have recessed details which are even and of a suitable size for the scale. As you would expect from a limited release manufacturer, there are no location tabs or point so carefully alignment is a must. Test fitting of the wing sections shows a very neat join, so I wouldn’t expect much in the way of problems for the rest of the model. It’s nice to see a blanked off intake section, with the blanking plate as part of the rear wall of the cockpit. 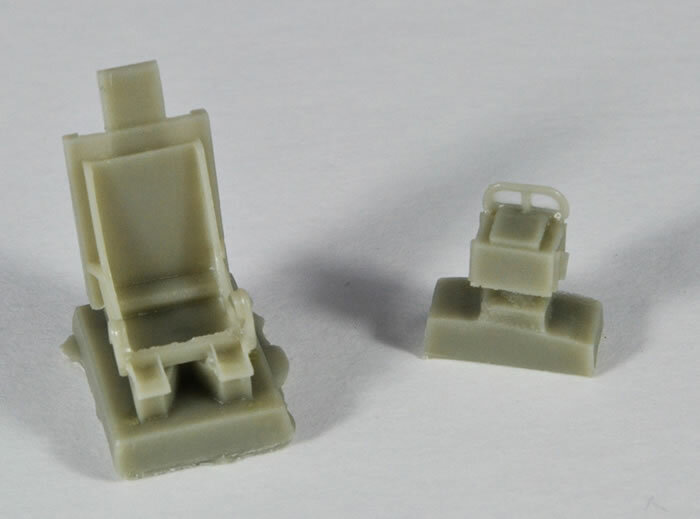 A neat resin seat comprising of the seat and the headrest, comes with the kit. 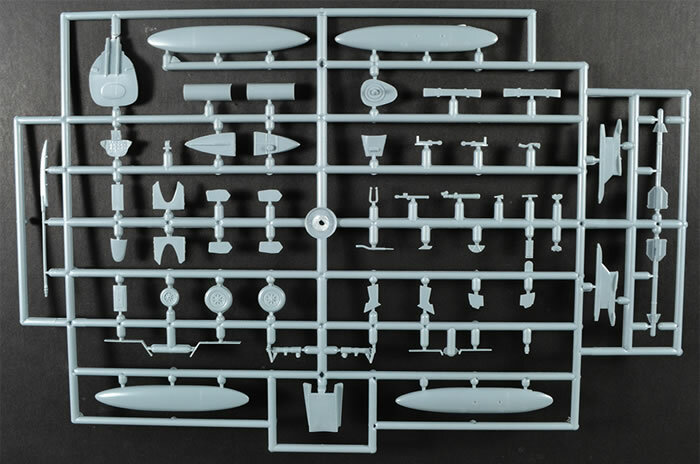 No seat belts moulded on it, which is a shame, as Sword included them in the P-80 A/B kit. The canopy is a clear and fault-free moulding. The thickness is quite appropriate for the scale. The multi-part canopy allows you to have the canopy either open or closed. 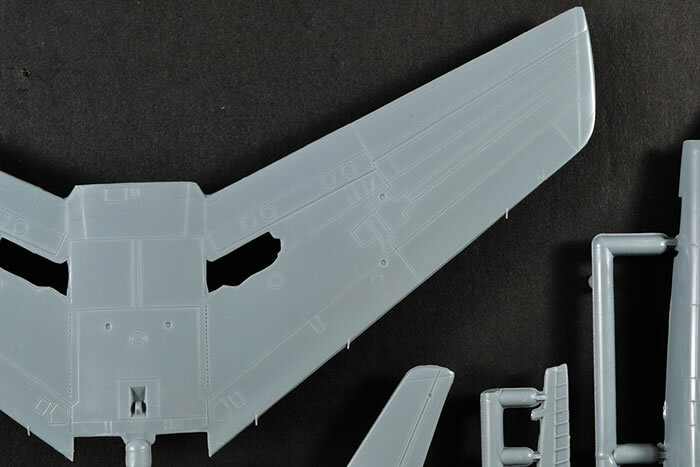 There are also a clear wing tip lights, HUD glass and tail light on the sprue. There are 3 schemes, which are all gull grey over white versions. Thanks to Sword Models for the review samples.